The Daedric Style is a crafting skill that can only be learned by reading the book Crafting Motif 14: Daedric Style. Learning this style requires a rank of 9 or higher in Metalworking, Tailoring or Woodworking. Crafting Daedric items requires Daedra Hearts. Like all styles, it is purely cosmetic. Items will have the same stats regardless of the style you use. All armor has a single style across all material tiers. One style shared for Iron and Steel as well as Maple and Oak. One style for Orichalc and Beech. One style for Dwarven / Hickory and above. 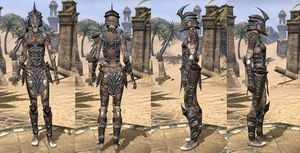 Another peculiarity of the Daedric style is that the light armor Breeches are not pants, but instead a skirt. 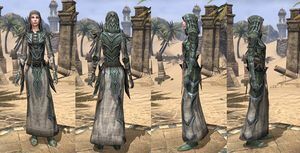 This allows achieving a robe-like lower body appearance while still being able to wear e.g. a heavy Cuirass on the torso. 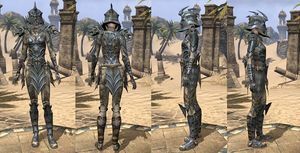 A character wearing mostly heavy armor with Daedric breeches.